The essence of the mind of all the buddhas and bodhisattvas is the bodhichitta, the awakened mind. When this bodhichitta assumes a form, it appears as Chenrezig, Avalokiteshvara. Whenever we practice Avalokiteshvara, the most important aspect of the practice is the generation and development of the bodhichitta, which is the compassion that Avalokiteshvara experiences for all sentient beings. So, if we also generate this same compassion, this same awakened mind, it will be very easy for us to accomplish Avalokiteshvara because the essence of Avalokiteshvara is the bodhichitta. Thus, the blessings and the results will be very swift. His consideration of sentient beings is all encompassing and constant. He is also sometimes referred to as “Jigten Wangchuk” because, until the three realms of cyclic existence are emptied from their depths, from his concerned activity he will appear in any way and in all ways. He will emanate completely and all-pervasively to make connections with and liberate sentient beings throughout the three realms. Thus, he is called the “One Who has Power Over the World.” These different names refer to the one deity, Avalokiteshvara. They are but different names for different emanations of the same single essence. To explain it from the point of view of the three kayas, in the dharmakaya nature Avalokiteshvara is Buddha Amitabha, in the sambhogakaya he is Nam Nang Den So, and in the nirmanakya he is Chenrezig, who appears both peacefully and wrathfully. In the peaceful expression he appears with one thousand arms and one thousand eyes, or with one head and four arms. In the wrathful expression he appears as Hayagriva. The wrathful expression is simply an intense expression of utter compassion that is necessary to tame the minds of beings who cannot be tamed through peaceful methods. Hayagriva also appears in many different emanations, sometimes with nine heads and eighteen arms, sometimes with three heads and six arms, sometimes with one head and two arms, sometimes red in color, sometimes black. When Avalokiteshvara appears as the protector, the dharmapala, he is the primordial wisdom protector Mahakala with six arms. When he appears as a wealth deity, he is the white Dzambhala. All of these various expressions are but different methods that the expression of the mind‘s compassion manifests to accomplish the needs and the purpose of all sentient beings. And because the numberless sentient beings are themselves different from each other, many countless, different methods are necessary. In fact, there are so many methods that if I were to explain them all we would run out of time before I could finish and you would all become quite tired. In short, the number of manifestations of this deity is inconceivable, yet they are all nothing other than the mind of compassion, the expression of the great bodhichitta. Therefore, we can say that, in a sense, more than accomplishing any other deity, to accomplish Avalokiteshvara alone is sufficient, because Avalokiteshvara is the essence of the mind of all buddhas and thus the essence of all deities. Furthermore, Avalokiteshvara is quite easy to accomplish. It is taught that if one practices Avalokiteshvara very well, for six months without interruption, then one will certainly have a sign of accomplishment. There is no way that there could not be a sign of accomplishment. This means that one will have a direct vision of Chenrezig or some other sign of accomplishment. Also, it is very easy to recite the mantra, “OM MANI PEME HUNG.” It comes quite naturally for everyone. Buddha Shakyamuni said that of all the different recitations, there is no greater benefit to be derived from any recitation other than the recitation of “OM MANI PEME HUNG,” the mani mantra. Of all practices that are based on recitation, this is the most powerful, the most beneficial. To accomplish any other meditational deity we must know how to accomplish the generation and the completion stage, we must know how to perform the sadhana correctly, we must know how the practice is put together, we must know how to construct the mandala, and we must know many other things that can actually be quite difficult and complicated—just to accomplish the deity. But the accomplishment of Avalokiteshvara is quite different in that none of this is necessary. There was a lama in eastern Tibet who was known as the “mani lama” because the only practice he did was Avalokiteshvara. He said that even when one is experiencing desire, or any of the other poisons, like jealousy or aggression, when negativity is arising in the mind, one can still practice Avalokiteshvara and recite “OM MANI PEME HUNG.” In other words, one doesn’t have to put the practice aside or transform the poison or do any other such thing, because the practice itself simply eliminates the conflicting emotions. This is because the six syllables of the mani mantra have the power to eliminate the six conflicting emotions, which are lack of awareness (delusion), pride, aggression, attachment, jealousy, and avarice. The six syllables also have the specific power to close the door to rebirth in the six realms of existence because each and every sentient being in all the six realms, without exception, has in its body six syllables that correspond to rebirth in the six realms. The cause of wandering in cyclic existence is due to the condition of the presence of those six syllables. When you recite “OM MANI PEME HUNG,” the six syllables of Avalokiteshvara, it is important to understand that they have the power to subjugate and eliminate the ordinary samsaric six syllables, thus obstructing or closing the doors to rebirth in the six classes. That is one specific power of the mani mantra. Also, in this very lifetime, simply reciting “OM MANI PEME HUNG” will eliminate illness, disease, and demonic force possession. One will become happy and peaceful and fully endowed. Reciting it will enhance ones power to meditate and one will develop deeper levels of meditative absorption in this lifetime that will carry over into future lifetimes. At the time of death one will not have to take rebirth in the three lower realms and will instead be reborn in Dewachen, the Western Pure Land of Great Bliss, or in Avalokiteshvara’s own pure realm of Riwo Potala, and there one will gradually achieve the status of buddhahood. Until that time, the blessing and the power of ones practice will not be exhausted; it will continue to produce the result of enlightenment. Avalokiteshvara is truly unlike any other deity. Many people are attracted to the wrathful deities, like Vajrakilaya, Hayagriva, Guru Dragpo, and so forth, and want to accomplish them, but unless one knows very well and exactly how to practice the generation and completion stage inner tantric practices of the wrathful deities, it is very difficult to accomplish them. Avalokiteshvara, however, is very simple to accomplish, and the mani mantra is very easy to recite. So keep these things in mind. There are many who think that the Avalokiteshvara practice and the mani mantra are just for simple folks and children and old people, not for real practitioners and scholars. This attitude is based on ignorance; it is absolutely mistaken. In fact, of all deities, Avalokiteshvara is the principal deity and the most important. This is true today and it was true in the past, during the time of the great pandits and mahasiddhas of India, almost all of whom achieved their realization through their practice of Avalokiteshvara. Each and every one of them had visions of Avalokiteshvara, and it was through those visions that they received their spiritual attainments and realizations. And in Tibet, especially, all the greatest masters had the strongest connection with Avalokiteshvara. They had visions of Avalokiteshvara, they were given prophetic indications from Avalokiteshvara directly, and it was through Avalokiteshvara that they achieved spiritual realizations. The blessings of accomplishing Avalokiteshvara are extremely great. Have no doubt about this. To recite even just one round of the mani mantra is of tremendous benefit, inconceivable benefit. To pray to Avalokiteshvara from the depths of ones heart and recite the mantra is truly a very profound practice in itself. If you pray to Avalokiteshvara regularly, and recite the six-syllable mantra as much as you can, it is absolutely certain that when you pass from this life you will not take rebirth in the lower realms. So, consider this and incorporate the practice into your life. You should see all appearances as the form of Avalokiteshvara, you should hear all sound as the speech of Avalokiteshvara, which is the six-syllable mantra, and you should consider that all arising thoughts are the mind of Avalokiteshvara. You should have compassion and loving kindness for all living beings without exception, from the tiniest insect to the largest being, because all of them, just as you do, wish to be happy and have a desire to experience bliss. Not a single one of them wishes to suffer. So, it is important to always have loving kindness for all sentient beings, maintain the threefold state of pure awareness, and recite “OM MANI PEME HUNG” as much as possible. This entry was posted on 13131313, in Mani mantra. Today, i would like to share a short practice on Chenrezig for anyone who wishes to do this practice. It was written by the Holy Mahasiddha Drubwang Konchok Norbu Rinpoche (left). Many people have heard of this master who recently passed into parinirvana in 2007. He belongs to the Drikung Kagyu Tradition and has attained complete enlightenment due to his efforts in one life. A contemporary Milarepa, he did retreat for more than 30 years in difficult circumstances and almost no resources. Many great masters like the Dalai Lama, Garchen Rinpoche, Drikung Chetsang Rinpoche, Khenpo Tsultrim Gyamtso Rinpoche deeply respect his accomplishment. One of the unique thing about Drubwang Rinpoche is that due to a prophecy he received from Guru Rinpoche in a direct vision, he would only teach people to do the recitation of the mani mantra almost exclusively. Sometimes he also advises people to recite the Guru Rinpoche mantra and the Amitabha mantra (these three mantras are collectively the mantras of the 3 kayas or 3 dimensions of a enlightened Buddha mind). 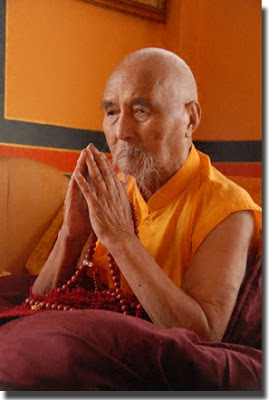 Drubwang Rinpoche completed more than 12 cycles of 100 million mani mantras himself and he has always widely and fearlessly proclaimed that the mani mantra is the all-sufficient and complete practice in itself. That the mani mantra is the Buddha, that the mani mantra can bring us to realize our true nature of the mind (the inner Buddha) and it can eradicate all the past karmic obscurations and bring us to the pureland. Especially he has always emphasized that the benefits of the mani mantra, though not obvious now, would be extremely potent and beneficial after our death. Rinpoche said that for busy people like us with little inclination for more complicated practices, the mani practice can be a most helpful companion in our lives and we should recite the mantra all the time, everywhere. Rinpoche would even recite this mantra in his sleep. Now, i will write abit about this precious mantra. It has been stated that any other form of virtue carries the danger of being destroyed by the power of aggression or other emotions, whereas the recitation of the mani mantra cannot be destroyed by any external, internal or secret force. There are two kinds of merits: perfect and ordinary merit. Perfect merit can only be attained if the three excellences of pure motivation of Bodhichitta, pure main practice free from conceptualizations and pure dedication are present in the act of virtue. However, for the mani mantra, just reciting it is naturally perfect all by itself. There is limitless benefit in reciting this mantra. A prayer and offering to the body, speech, mind, qualities and activities of all the Buddhas. It purifies obscurations of body, speech, mind, afflictive emotions, habitual tendencies and obstructions to omniscience. The mantra OM MANI PADME HUNG is the embodiment of all the Buddhas’ heart, the root of the eighty-four thousand teachings of the Buddha, the essence of the Five Buddhas, and the essence of the secret holders. Not tarnishing anything you undertake with selfish vested interests. Be vigilant in your formal practice, subsuming everything within your own true mind. Don’t make mistakes, don’t make mistakes! One’s children up to seven generations will not be reborn in the lower realms. This is one way that parents can benefit their children and grandchildren. Then one’s body becomes blessed. So when a person who recites one thousand OM MANI PADME HUM every day goes into water, into a river or ocean for example, that water becomes blessed. Whoever that water touches fish, tiny or big animals, or tiny insects, the negative karma of all those sentient beings is purified and they do not get reborn in the lower realms. At the time of death, when the body is burnt, even the smoke that comes from it purifies the negative karma of whoever it touches or whoever smells it. The negative karma of those sentient beings to be reborn in the lower realms is purified. Here is the sadhana practice of Chenrezig composed by Drubwang Rinpoche. It is short, anyone can practice it and the benefits will be immense. Especially if you can do it till the end of your life. Please don’t don’t don’t underestimate this simple and most incredibly effective practice. This entry was posted on 13131313, in Practices and tagged 100 million, avalokiteshvara, chenrezig, Drubwang Rinpoche, Konchok Norbu, mani, practice, sadhana.